And I could have definitely used it this year. Oh yes. I could have. I’ve spoken before about how lonely it can be, staying at home. Generations ago, most women stayed home with the kids. It was common to know the women in the neighborhood and out of a need for survival, they would come together for coffee, let the kids play, chat about their families, prop each other up. Help each other out. Be a shoulder to lean on, those long, difficult days. These women were, in each other, someone besides their husbands that cared about them. 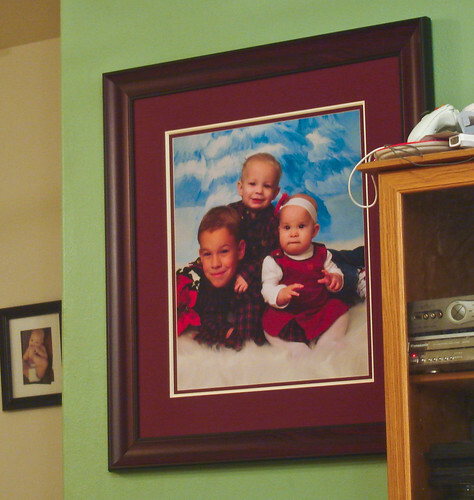 If they didn’t live in the same town with their families, that bond was imperative. These days… the neighborhoods are empty during the days. Everything is quiet. No moms. No kids. Nothing. There are avenues for making friends, but it’s hard. A lot of people make friends at work. When you don’t work, you make friends at your child’s school, church and church functions, the store. And when you’re shy, it makes it that much more difficult. And when you’ve been burnt, it makes it even harder than that. I have a lot of friendly acquaintances, on and offline. I have friends, I’m sure I do, but often circumstance and distance keep us from really being able to rely on one another. I could use more friends. I need more friends. We have no family anywhere close. We have no one, generally, to hang out with on summer evenings, or winter evenings or spring evenings… you get the idea. No game nights, no barbecues, no pool parties, no meeting for lunches out, no shopping dates, no movie nights. It’s got to be as hard on my husband as it is on me. Though surely he’s busier with work and isn’t as aware of the gaping absence of friends. Still, I know there are times he’d like to have some people who are close to get together with and celebrate, even if it’s just to celebrate the weekend. I don’t know how to change this. I don’t think I can. Well, not here at least. It’s a cop out, but I’ve convinced myself that living in Reno is part of the problem. And not just Reno, but WHERE in Reno we live. We’re fairly isolated out here. No one wants to drive clear out here. I don’t blame them! I probably wouldn’t want to either. Maybe if we lived somewhere else, another state even, it would be better. Easier. At least a clean slate would help, right? Online friends are great but there lacks that closeness. And a lot of times they are still just acquaintances. Someone who is nice to chat with, but not someone you can trust or count on. Not a friend. Aaaaaaand, on that happy note, I’m going to bed. Be good to each other, y’all. I’ve been a big time, grade A, first class blog flake lately. Not exactly news for anyone who has been keeping track of my update schedule over here, to be sure. But I’ve also been a flake in keeping up at my friends’ blogs. Now THAT is pretty sad. This knitting obsession of mine has taken over. Any spare time is spent knitting. And while I will often compose pithy and humorous blog posts in my mind while I’m knitting my bazillionth pair of baby pants, composing something in your mind isn’t quite the same as putting the knitting needles aside and typing it up on the laptop. And Google Reader is literally starting to get cobwebs around the corners. I used to do the bulk of my blog reading while I was nursing Evie, via my iPhone. But lately I’ve been sucked into some stupid iPhone games and that is generally what I’m doing when I would normally be reading blogs. What is my excuse? I don’t have one. And I feel bad, because I feel like I’ve missed out on some things with some of the bloggers I consider myself closest to. What does it say that I just found out like two days ago that Brit’s blog was busted? Something I could have helped her with, I’m sure, but I was a flake. So I didn’t. Shoot, I spend more time on Facebook, reading up on people’s statuses than I do reading their blogs. This has to change. I don’t want to be “that blogger”. The one who is completely out of the loop and detached from the community. I know notgoing to BlogHer this year has affected me this way. Why bother to connect to the community when I’m not going to BlogHer? What’s the point? Of COURSE there is a point. But when you’re a) lazy and b) occupied elsewhere, well… excuses come easy. There’s no reason why I can’t keep up my blog and read my favorite blogs though I’m not going to BlogHer. And there’s no reason I can’t do this while I continue knitting. I just need to get my act together. I hate being a slave to stats, but the stats don’t lie. And they show a significant drop in the last six months. Again… NOT COOL. I’m letting people down. I’ve become BORING. GAH! The weekend. The blessed, blessed weekend. Hallelujah. The taste of peppermint schanpps in hot cocoa. How clean and warm I feel after taking a shower. Long phone conversations with a good friend. Thanks, Michelle. I am not domestically inclined. I hate doing housework, I’m not a very inventive cook and I couldn’t organize to save my life. My home reflects this about me. I would like a clean house, dinner on the table and a more organized lifestyle but I am at a loss as how to achieve that. I am a huge housewife FAIL. I’m not “one of those” moms. I don’t volunteer at my son’s school, drive carpools, attend a plethora of playdates or throw fantastic birthday parties. All of that stuff is way, way, WAY outside my comfort zone. And I worry that this is going to negatively impact my children. Socially. I already see it with Harry and it makes me feel guilty like you would not believe. I’m not beautiful. There are a lot of things about myself that think are downright unattractive. Whenever I get my hair cut or dyed, buy new clothes or shoes or purchase and wear makeup, that is just me trying to make myself bearable to myself. I’m not socially talented. This swings both ways. While I’m not very good at putting myself out there, it also means that I don’t employ a lot of “tactics” that I think a lot of women just assume that other women use. I don’t hang around people I don’t enjoy, so please don’t think me the sort to be manipulative or schemey. What you see is pretty much what you get. By the same token, I don’t pick up “hints” very well. Because, as I said, I’m not socially talented. I virtually always need someone to come right out and say something if they want me to do something. Because chances are, I’m not going to come up with it on my own. I wish I could, but my brain just doesn’t work that way. I’m not at all outgoing. This means I don’t call anyone on the phone (and when I say anyone I mean ANYONE) (I call my mom and I call Kile and THAT’S ABOUT IT). I don’t approach people out in public. I don’t stick my nose out in pretty much any social situation. I’m painfully shy and bad social experiences seem to only reinforce this backward behavior. I’m not the sort that shows her feelings all the time. I generally try to put for a very calm personna and it works pretty well. It’s a coping mechanism. But I do experience hurt and sadness. Depression and anger. If you knew me several years back, after we lost Jackson, and thought, “Wow, she is so strong! I don’t know how she does it!” just know that behind the scenes, I was a complete and utter waste of a person. I still am in many regards. I’m aware that there are some of you who don’t like to read posts like this. I’m sorry. I’m just in a mood today. It’s been a rough day around here. And these are all things that I think and that I know about myself. It’s not opinion, it is fact. It’s not very happy or pretty, but it is fact. So in the comments on yesterday’s uber-whiner post, Cagey said she hated posts like that (and so did Michelle, for the record), where I beat myself up (but I’m such an easy target!). So in an effort to balance everything out nicely, I thought I’d do a post wherein I detail everything that is Totally Awesome about yours truly. Because while I still believe that in some, way, shape or form that I am a la-hoo-ser, I do recognize that I have some good traits. Somewhere. Maybe there in the corner under that layer. Ahem. Here goes! I have some really cute kids. As evidenced by the MONDO picture we picked up yesterday from Sears. Seriously, ya’ll, it’s adorable. And you should check out my full review of Sears Portrait Studio while you’re at it. I have a fondness for writing that makes up for it’s lack of talent with an excess of enthusiasm. I may never be a literary genius, but maybe someday I’ll get published. That’d be awesome. I love animals. I always have. When I was little, before the days of Animal Planet, I used to love to watch those wild animal safari type shows on PBS. I’ve always loved having pets too. For a long time, I was a big cat person, but thanks to Tiger, we’re taking a bit of a cat-break right now. We have our hands full with the dogs now anyhow. I like to think that I have a decent sense of humor. This might not be the funniest blog out there and I’m in no way implying that it is. But I do know funny when I hear (or see) it. My dad used to always say I had such a great sense of humor. I love to laugh. I love to surround myself with funny people. I love Christmas. There, I said it. I know it’s sorta fashionalble anymore to be something of a Scrooge, but I can’t help it. Tis the Season to be Jolly. I don’t love the stress associated with the holidays but I absolutely ADORE the wonder. And I love sharing that wonder with my kids. In a related vein, I love cold weather. I love snow and rain and clouds. I don’t love wind (but then, after living in Nevada you realize it doesn’t need to be cold to be windy). I can’t wait until this mild weather is gone and we get some real good snow storms. I’m loyal. I’m not the sort to ditch out on someone when a “better offer” comes along. Once I’m a friend with someone, it takes quiet a bit to shake that. I give my friends the benefit of the doubt in iffy situations. This has, in the recent past, led to me getting walked over, but I think it’s an important trait to have. Because if you can’t count on your friends to back you up in times of need, then who can you count on? I have awesome taste in music and movies. If I do say so myself. And I do. Cuz this is my blog. And I’m not talking about artsy-fartsy, alternative taste. Yes, there are some awesome indy movies out there and some fabulous unknown musicians out there. But I tend towards the mainstream and I love popular movies and music. It’s the great equalizer. And look at it this way, I’ll never make you feel bad for loving “Armageddon” (cuz I do too) (but I will hold “The Fast and the Furious” against you because that movie and all it’s spawn are CRAP). There you go. Some of the things that make me awesome. Don’t you want to be my friend now? If not for my husband and kids, I would be entirely lonely. So I guess it could be (a lot) worse. But the fact of the matter is that I don’t have a lot of “girl time” to enjoy. Well, it’s not the “time” I’m lacking so much as the “girl”. I have no friends. Nobody likes me, everybody hates me, guess I’ll go eat worms. And I think the longer that I don’t have friends and the more I am holed up here in my home, clacking away on my laptop, the more anti-social I’m becoming. I have always been shy and introverted, but that never seemed to get in the way of making new friends. So I don’t think I’m a total loser, you know? Or at least, I didn’t used to be. Maybe I am now. Lah-HOO-ser!! I tried and a couple years ago, I thought I had finally hit the jackpot. I had some friends that lived nearby that I loved to hang out with. Our families loved to hang out too. Kile enjoyed them, Harry enjoyed their son, etc and so forth. It was like the answer to my prayers. Then… things went downhill. I still to this day can’t put my finger on exactly what it was. Was it me? Perhaps they didn’t enjoy me as much as I did them. Which, of course, stings. It makes you step back and question yourself. So it’s easy to see why, after a few failures on the social front, that we tend to keep to ourselves more and more. It’s safer that way. Simpler. Easier. I love to take shortcuts, especially if they make my life simpler and easier. And withdrawing from society is so simple and so easy. And so safe. If you don’t put yourself out there, you can’t be disappointed. You can’t get your feelings hurt. You don’t expose yourself to rejection. You feel lonely, but if you try hard enough and long enough you can get used to it. And you can even get to where you don’t even really notice it so much anymore. Lonely becomes the New Normal. Maybe Reno is the problem? It wasn’t so hard to make friends in college, but since being out on our own, it’s been so much harder. Are people here just not that friendly? Would it be easier if we lived somewhere else? Would another neighborhood be better or would we need an entirely different part of the country? Why am I even thinking about this in the first place?? Who knows. I just wonder, from time to time, what my life would be like if I had some good friends to hang out with fairly regularly. I’m sure Kile would appreciate it, because then I wouldn’t be hassling him to come see “Twilight” with me this weekend. Who's going to play with me now? I’m sure you’ve heard me mention MOPS on here before. Basically, it’s a group of moms of children who are 0-5 that meet twice a month and listen to speakers, have breakfast, participate in a discussion and do crafts all while their children are in “classes” of their own, doing their own activities and projects. Most of all, it’s time off for mom, to recharge and talk with other women. And for the last six years of my life, it’s been a lifesaver. Six years ago, I was going to storytime at the local library with my then two yeard old (closing in on three) son. Storytime was a way to get out of the house, be around other children and interrupt the monotony of the day. I had no friends locally. I was online, but not like I am now. I felt very alone and lonely. And I worried about Harry being socialized with other children. He had no friends his age. It was at a storytime that I met another mom. She had a daughter that was Harry’s age and was pregnant with another. She seemed perky and friendly and approached me after storytime to ask if I would be interested in joining her group. Before I knew what was going on, she had some sign-up papers. This was no mere playgroup. There was registration forms! And dues! I wanted to take part because I was desperate for interaction. But I was unsure about the cost. Money was tight (when isn’t it?) and I wasn’t sure we could cover the dues. So after telling the nice woman that I would be there, I had second thoughts. I guess I would have to find something else. I thought that would be the end of that. But it wasn’t. She nice woman called me after I wasn’t at the first meeting, wanting to know why I wasn’t there. I explained to her, rather embarassed, the money situation. She urged me to reconsider. The church that was sponsoring this group was offering “scholarships” so that anyone who wanted to go but felt they couldn’t could still attend. That sounded a lot like me. So I went. And I only missed one meeting in the next six years. MOPS was a lifeline. I attended MOPS during some of the roughest times in my life. Infertility and treatment, pregnancy loss, broken bones, broken hearts, pregnancy and babies… The last six years of my life have been filled with major life events. And MOPS has been there all the while. Whether I had a baby, broke my ankle or lost a baby, there were always women there to bring our family meals. Regardless of what dignosis I received at the doctor or how my thyroid was behaving, I could always go to MOPS. While I couldn’t say that I made any best friends there, I did make some friends. And if nothing else, for two + hours two Wednesdays a month, I had some place to go, somewhere to drop off my children and other women to interact with. What more could I really ask for? I just found out a few days ago that our MOPS group has, for lack of a better word, ended. There was some difficulty in finding leadership, the hosting church (the church we happen to attend now, thanks to MOPS) is having budget struggles and, probably most of all, it is just time to move on. It happens. It’s still sad. It’s the end of an era. Does this mean I’m an adult now? There are other MOPS groups in town. In fact, a lot of the women from my old group are attending one group in particular and have sent along the information on joining, should I be so inclined. I’m just not sure. My introverted nature is rearing it’s head. I don’t process change very well. Would Liam do as well in an unfamiliar church with unfamiliar surroundings and teachers? What about Evie? I would probably have to put her in childcare too, which I haven’t done yet. And what about when Harry is out of school in October and February? At the old group, I would bring him along and he would either help Kile out while he watched the two year olds or go in with the 5 year olds and play/help there. I don’t know if I could do that at this new place. Plus there’s the unfamiliar church, unfamiliar people. I would probably feel enormously out of place. Where would I park? What if I got lost? Why am I such a flaming nerd? So I probably won’t go. Perhaps it’s for the best. Maybe, after six years, it’s just time to end it once and for all. I’m sad to see it end. But maybe it’s just time. So I stole this from her who in turn stole it from HER and now here we are… the place stolen meme’s go to die. And while I’m fairly sure I’ve done a meme just like this already once before a) I’m far too lazy to look it up and b) I don’t really care because I want to do it again. 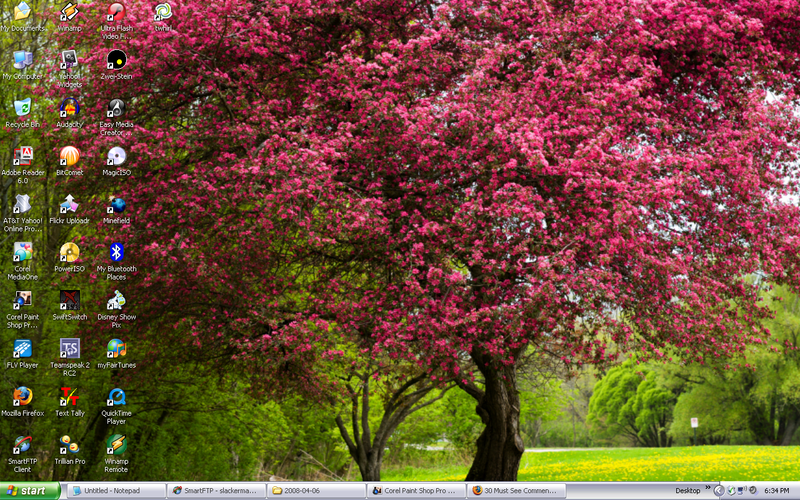 And because I’m deluding myself into thinking that you all really want to know what my computer desktop looks like. You do, don’t you? Go to your desktop and press the Print Scrn key (located on the right side of the F12 key). Open a graphics program (like Picture Manager, Paint, or Photoshop) and do a Paste (CTRL + V). If you wish, you can “edit” the image, before saving it. (IMO that takes away from the integrity of the meme… I want to see the desktop as is). B. Post the picture in your blog. You can also give a short explanation on the look of your desktop just below it if you feel like doing it. Tell us why you decided to choose this picture. C. Tag your friends and ask them to give you a Free View of their desktop as well. Yeah, except that I don’t tag. Which is why meme’s die here. So without further ado, here is my desktop. Click on it to make it show up all big n’ stuff so you can see all nifty little icons and whatnot. I showed you mine, now you show me yours. It’s hard when you become a parent, particularly a stay at home parent, to have the kinds of friends you had when you were younger. I feel like I’ve talked about this so many times that you’re all probably bored to tears. Still, I’ve reached some peace with the whole topic, I think. I recognize that part of what makes it so hard when we become parents is that our schedules are so hard to synchronize. When you’re talking about two moms who have young kids at home, you have to find a time that they can both get away from their kids, if you want to do a “mom’s only” sort of outing. And then, everyone has to be in the best of health. No colds, fevers, flus, aches, pains, etc. That goes for the husbands too because surely we cannot expect them to watch the children when they themselves are ill, right? The sick thing also goes if you just want to get together for coffee and let the kids play because naturally if one child is sick then ALL the kids are sick. And, a lot more subtle is that there must be a desire from both mom’s to actually get together. Taking care of kids all the time makes one feel rather tired. Sometimes it is just easier to stay put alone than it is to go out on a limb and get together. And sometimes it’s easier to just keep the status quo. Yes, it’s lonely. But it’s predictable. I’ve done this a couple times myself, I’m rather ashamed to say. I’m trying to go out on a limb more, to put myself out there. It does seem like after you’ve spent so many years shut off from society (honestly, that’s what it feels like sometimes) that it’s even harder to put yourself out there. Doubly so if you’ve been burnt in the friends department. Willing to make last minute plans. Say it was a Saturday afternoon and I have an urge to go out shopping for clothes. The boys would rather be shot than venture out to the mall so it looks like I have to go on my own. In this situation, I could call up a mama friend and ask if had anything going on and would she like to go shopping with me. In this ideal situation, she would say yes to this initiation more often than not. Looking back at that first “requirement”, I realize I need to add “I would feel confident enough to call her up at a moment’s notice like that.” Because we all know I’m awful with the phone. Better with text messaging but that’s not the same and we all know it. I never feel confident just calling people up out of the blue. Pretty much the only person I ever call is my mother. I don’t know what it would take for me to feel that comfortable but I imagine in the right friendship with the right intimacy level, it’s possible. Someone I can share all the details with. Now, I tend to sort of do this anyhow, even in situations where I probably shouldn’t. I have no idea why I do that. But it would be nice to know that I would never regret speaking my mind and spilling the intimate details. Sometimes I worry afterward if I should have spilled it all and how awesome would it be to know that the secret is safe with her? Someone who would make me a priority. This is a tough one. When you’re a mom, your priorities shift dramatically from what they were in high school. Your husband and kids become your first priorities, as they should be. Before you know it, you’re up to your eyeballs in priorities. Home, church, school, work (if you work), relatives… Gah! Friends definitely can get lost in the mix. And I do understand this is not a cut and dry issue. Still, it’s been a long time since I’ve felt like I’m a priority outside of my own family. How great would it be to have a friend say she’s going to make a point to spend some time with me, regardless of what else might be going on? Husbands who enjoy each other. Wouldn’t it be a tragedy to have all the other “checkpoints” marked off and this one fails? I’m sure we’ve all seen it happen. The moms get along famously and have high hopes for all the fun their families will have together. Then, the husbands meet and the general reactions is… meh. They don’t have anything in common, they have conflicting personalities, whatever. Finding a good match between husbands can be as difficult as finding a good mom to be friends with in the first place! I always feel a tingle of happiness when my husband gets along great with another husband, talking up a storm or playing video games together. Lastly, someone who genuinely cares about me and my family. I’ve been lucky. I’ve known a lot of people who care about me and my family. Some of them have been friends and some of them have been more acquaintances, but we’ve still been very blessed in that department. Sometimes though, I think it’s easy for this one to take a backseat. People get wrapped up in their own lives, their own families, their own issues and forget to wonder how the other side feels. It happens when we get busy, I think. The last thing we want to do is hurt each other’s feelings (I desperately want to believe that), but sometimes I think we lose sight of others. It’d be awesome to find a friend who would be kind, understanding and compassionate towards me and mine on a fairly consistent basis. I’m sure there are more points and that I’ll think of them over the days and weeks to come. But these are the groundwork. I definitely realize how difficult it is for all these planets align, too. Trust me, I understand. I’ve seen firsthand how friendships suffer after we become parents. Still, I refuse to give up on my ideal dream. I believe I can have a great friendship with someone. It might not happen this year, or even next year. But some day (of course, hopefully sooner rather than later). What about you? Do you have an “ideal friend checklist”? Okay, so my husband’s “embarrassing things about Marilyn” posts are getting a little humiliating, aren’t they? And he never tells me ahead of time what his post will be about that week. I just have to wait until he POSTS it to find out. This week? I take some exception. Not to “Star Wars” since somehow, I don’t find that as awful as admitting that yes, I was into “Days of Our Lives”. Not even “Titanic” or “The Cutting Edge” are as humiliating. So I feel I must expand on this, as way of explanation. I got into “Days of Our Lives” when I started high school back 1990. I had some friends that were watching it and I watched it too one afternoon. I found myself getting sucked right in. And like most teenage girls, I found a couple to focus on and fixate over. Now, for most of my friends, that couple was Jack and Jennifer. He was funny, she was cute and they were adorable together. But not me. Oh no. No, I was a Bo and Carly fan. Anyone who watched DOOL in the late 80’s or late 90’s or even now, probably goes, “HUH? Don’t you mean Bo and Hope?” Yeah, no. Bo and Carly. See, this was when Hope was dead (isn’t everyone on a soap opera dead at some point?) and Bo was left by himself, depressed and alone with a young, deaf son to raise. I forget now how the son was deaf in the first place, and he didn’t stay that way, but there you have it. Carly was a doctor, new in town and mysterious, and she happened to be fluent in sign language. The kid loved her from the start, Bo did not. To this day, there are certain songs that I still associate with that era. “Oh, that’s the song they played on that commercial during the show’s big anniversary week! You know, the one with the comedy montage?” Sad. I would watch it every day, usually taping it and if the show was particularly good, I would watch the Bo and Carly scenes OVER and OVER and OVER again. It wasn’t pretty. I knew of a grocery store in town that had Soap Opera Digest on sale a day early and my friend would drive me over there so I could pick it up every week. And if that issue contained pictures of Bo and Carly? Well, those got cut out and plastered up on my wall in my bedroom, right next to my bed. I had a little shrine thing going. I was so obsessed with DOOL during this time, that friends of mine became wary of even bringing up the subject around me. It was all I ever wanted to talk about. Missing episodes was a traumatic experience. I disliked the first Gulf War so badly because it preempted so many shows. Things reached a fevered pitch when Bo and Carly had their little Mayan wedding atop the pyramid in the Yucatan, but shortly after that, the guy who played Bo left and they brought a new Bo in. Uh, no. I wasn’t loving it. The storylines were getting goofy (they were already goofy though, I have to admit), I was getting older and just didn’t have the time or interest anymore. So by spring of my junior year of high school, I was off “Days of Our Lives.” Once and for all. Haven’t watched it since. It’s a goofy show, that’s for sure. I grew up on “All My Children” and watched it up until very recently (damn them for killing of Dixie, AGAIN!). But I never feel the fever for it like I felt for DOOL. I look back and I cringe when I think of how I acted about that silly show. Still, it was an important part of my life at that time and goofy or not, it did shape who I am today. So kids, listen to your parents and just say no to soap operas. They’ll rot your brain. These days, housing is much more than carpets and furniture. From the home lighting to the security plans to the beds, everything constitute it now.